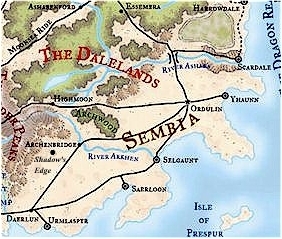 Shadow's Edge is a small town in northern Sembia, just south of the Thunder Mountains. After suffering through a plague in early 1372 that was magical in origin, the leaderless community was apportioned to the heroes who saved it. The Shadow's Edge campaign revolves around a core of those newly appointed nobles and other PCs that live in the community. It is currently run on the Wizard's of the Coast message boards. The nobles are currently adventuring in the Dalelands, but should return upon finishing that task.